Warsaw - UEFA opened disciplinary proceedings Tuesday against the Spanish and Russian football federations for racist behaviour and racist chants by fans at Euro 2012. 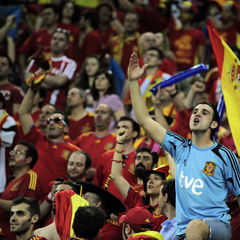 Spain fans are accused of "improper conduct" at the group C match against Italy in Gdansk, Poland on June 10. Italy striker Mario Balotelli was reported to have been the target of racist chants during the match. Similar proceedings against the Russian federation follow the group A match against the Czech Republic in Wroclaw, Poland on June 8 when racist chants were reportedly directed against Czech defender Theodor Gebre Selassie. The UEFA control and disciplinary body will deal with both cases on Thursday. The Croatian federation was meanwhile been fined €30 000 by the control and disciplinary body for crowd incidents at the group C match against Spain in Gdansk, Poland on June 18. Fans set off fireworks and displayed "inappropriate and racist banners" at the match, a statement said. The Portuguese federation was fined €7 000 euros after a fan tried to invade the pitch at the quarter-final against the Czech Republic in Warsaw on Thursday.